"Secretly Smitten" is composed of 4 novellas that flow together into one overall story. Each novella centers on one of the four women in the Thomas family. The mystery of how the dog tags of Grandma Rose's 1st love (who died in the war) ended up in the attic runs throughout all four of the stories. "Love Between the Lines" by Colleen Coble follows oldest sister Tess as she digs into the mystery of the discovered dog tags in the attic of the home where he had lived before the war. Will Tess find love along the way? "Make me a Match" by Kristin Billerbeck follows youngest sister Zoe as she starts up her matchmaking business. Will Cupid bring her a match, too? "Knit One, Love Two"by Diann Hunt follows the mom, Anna, and her store "Sit 'n Knit". Is romance being knit together? "Love Blooms"by Denise Hunter tells us the story of predictable, Clare, the middle sister who manages the plant nursery. Is she too boring, or will love bloom for her, too? The novellas were quick to read which I liked because I tend to stay up too late on occasion to finish the story so I can know what happened. In some ways, the romances in the stories seemed to take less time to grow than you'd expect, but when the story is a novella, there isn't a long time to develop the story line. 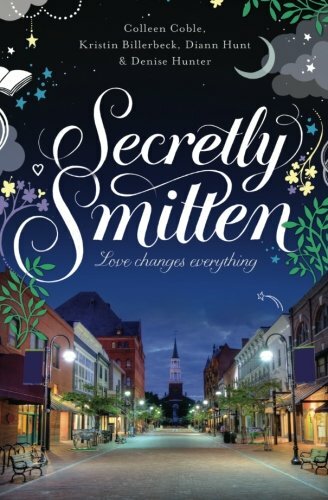 Overall, I enjoyed reading "Secretly Smitten" and would recommend it to those who enjoy romance stories where the "raciest" they get is kissing! I received a free e-book copy of "Secretly Smitten" to review for my honest review. No other compensation was received. I'm going to have to check out this book for some of the same reasons you like it: being four novellas it breaks it up making good stopping points along the way; not too racy (I hate it when what sounds like a good story spends little time on the story and a lot of time getting way to graphic), and an ebook, which means I can get it right away :-) Thanks for the review.